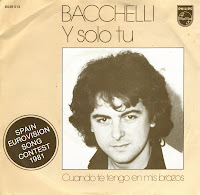 Bacchelli was born as José María Bacchelli Ortega in 1952 in Barcelona, Spain. He had a brief career in music in the late Seventies and early Eighties. In 1980 he released the album 'Prohibido'. A year later, he was selected to represent Spain during the Eurovision Song Contest. He performed the song 'Y solo tu' ('And only you') in Dublin, which reached 14th place at the end of the Contest, out of 20 competitors. The single was released in most of Europe, but commercial success did not follow. A second album, also called 'Y solo tu', failed to sell as well. Shortly thereafter he retired from the music industry.